Try a new experience with the unique collection of luxurious,creamy, stylish soaps from MuraSoap! Distinguished by refinement and creativity, Mura Soap is an exquisite fusion of chemistry, raw ingredients and the art of perfumery. Mura Soap is created for sophisticated people, who care about a simple, healthy life. 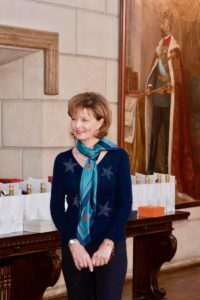 One of these people, and one who is very important to us, an example of life, elegance and inspiration, is Her Royal Highness Crown Princess Margareta of Romania. We are honoured and proud to send our soap to Elisabeta Palace, on special occasions and anniversary days, to show our affection and respect for the Romanian Royal House. Scientifically handcrafted in small batches, to ensure the quality of each batch, ingredients carefully chosen, for their skin and hair benefits, using the advanced technique – of the slow cold process -, so that the soap obtained contains all the natural glycerin, enzymes, vitamins, aminoacids, antioxidants and skin nutrition substances needed for a healthy skin. The most important ingredients are fresh goat’s milk, “the white elixir”, well known for its dermatological qualities and its rejuvenating effect on the skin and luxurious,virgin olive oil brought from Tuscany and from Volos (Greece). The other ingredients, oils and butters of the finest quality vary from one recipe to another. Most of them are virgin, cold pressed and organic. The scents are gentle and natural, original blends of fine, pure essential oils or absolutes extracts that combines beautifully on the skin, leaving it lightly and subtly perfumed. Each different scent is an unique olfactory adventure. The colour is given by different herbs and spices – Mura Soap also manufactures many of its own botanical powders. Mura Soap has combined personal inspiration and exploration to seek out the best ingredients, based on thirty years of chemistry and botanical studies and research that can be applied to a soap to give it the necessary cleansing, hydrating but also curative qualities.